AS he awaits another A-League opportunity, Harry Sawyer is happy to be back at Western Pride. During the A-League off-season, Sawyer said it was an easy decision to join his former Pride teammates and coaching staff at the Ipswich-based National Premier Leagues club. "At the moment, I'm trying to get some games in and fitness so I knew coming back to Pride was the best place to do that,'' Sawyer, 20, said. "They've got a professional set-up there in the state league in Ipswich. "It's a growing region and I think there's a lot of potential there for promotion. After a few weeks training at the Briggs Road Sporting Complex, Sawyer is preparing to play his first game this season with Pride against the Brisbane Strikers on Saturday night. 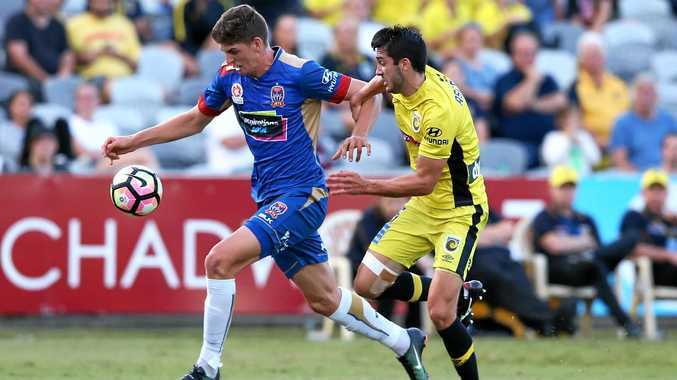 He was encouraged by his first five-month stint with the Newcastle Jets. After scoring a hat-trick against Sydney FC in his only National Youth League game for the club, Sawyer secured a spot in Newcastle's A-League squad. He went on to play five games at the higher level. "There's definitely a big step up from NPL to A-League,'' Sawyer said. The 195cm striker said the full-time training included up to two sessions a day. "I did cope with it quite well,'' he said, appreciating the professional standards set up at Pride under coaches Karl Dodd and now Graham Harvey before he advanced to the A-League. Sawyer put his economics and exercise sports science studies on hold while he chased his A-League dream. He's keen to see what future offers come his way. In the meantime, he's content being back with a number of talented teammates also keen to advance their football careers. "It's good to see there's definitely some of the core players still there,'' Sawyer said. "You can see that the older program that Pride had at the club is still working. "It's come on in leaps and bounds and you can see the quality of the players has increased and it's got a real professional vibe to it. "I'll play and train at Pride for the next couple of weeks and hopefully help them out as well. Sawyer was keen to lace on the boots against the Strikers at Perry Park on Saturday night. "I'm excited to play some games back in the NPL so it should be a good game against top of the table (Strikers),'' he said. WESTERN Pride head coach Graham Harvey was delighted to welcome Harry Sawyer back to the Ipswich-based club where he started his NPL career in 2015. That season, Sawyer played 21 games and scored seven goals before being recruited by the Brisbane Roar Youth team in 2016. Sawyer made a mid-season switch to Newcastle leading into the latest A-League season. In January this year, Sawyer became the first Pride player to secure an A-League debut. "Hopefully that transpires into some of the other boys,'' Harvey said of Sawyer's achievement. NPL: Saturday (6pm) - Western Pride v Brisbane Strikers at Perry Park. BPL: Sunday (3.15pm) - Ipswich Knights v Rochedale at Bundamba. CL2: Saturday (7pm) - Ipswich City v Pine Hills at James Drysdale Reserve.